Enter now for your chance to win 3 days recording (courtesy of Hermit Studios) a Single Release & Music Video. Previous Winners can be found here. All entries will be judged by a selection panel made up of industry experts and those chosen to progress further will be invited to perform live at a Regional Final, these take place in Jan 2019 (Solo Acts) & Feb 2019 (Bands) where the winners of each will go through to a Grand Final. There is no audience voting in this contest, each final will have three independent judges that will score the artists. Entry is FREE and the contest is open to artists of any age, any genre and all types (i.e solo, duo or band). Artists must have at least one musician based in the Essex and have at least one original song. The project brings together a network of venues, promoters, producers and other music types from across the county who share the same passion for supporting emerging artists and grassroots music. It is not-for-profit and there is just one simple aim – to help raise the profile of Essex based artists. 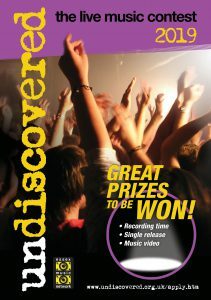 So if you are yet ‘undiscovered’ then get in touch at info@undiscovered.org.uk . Founded in 2009, Undiscovered was born out of a common goal of a small group of promoters who all shared a passion for supporting live music. Working under the banner The Essex Music Network (EMA), they decided the best way to work together was to organise a music contest. Not a original idea granted but what made this contest unique was that was to be run by people that are working within the industry, by people that wanted to help new & emerging artists, by people who are not in it for the money. Since then, and as more and more industry professionals have become part of the EMA , Undiscovered has become a continuing project rather than a just an annual contest and is now part of work of the Essex Music Development Agency.